Check for Signs of Koi Disease. Koi Diseases How to diagnose and treat common koi fish diseasesKoi fish are very hardy, robust fish and don’t often once become sick once they have settled into the koi pond.koi disease occurs in ponds as fish fall prey to parasitic, bacterial or fungal attacks.The causes of koi fish diseases varied and can range from a sudden drop in water temperature, predator attacks and spawning to name a few.No matter what the cause of the koi diseases, one thing remains constant – the sooner you recognize and begin to treat the problem …the more likely you will be successful treating the koi diseases.Regular pond maintenance and water-quality checks help keep diseases away from fish, but illnesses still occur, even in the best-kept ponds.The first sign of a problem may be a fish floating at the surface, by which time it is probably too late for effective treatment.For this reason, it is vital to set up a routine for examining fish; feeding time provides an ideal opportunity to check their appearance and behavior.So how do you know if you have a sick koi fish? Sometimes the signs that a fish is sick are very subtle, such as one fish segregating itself away from other fish, or not eating very much.As time passes and the koi disease gets worse, the symptoms become more obvious and may spread to other fish. The health of pond fish influenced by environmental conditions.During spells of hot weather, for example, evaporation can lower water levels, which has the effect of concentrating dissolved nitrogenous waste.Atthe same time, elevated temperatures drive oxygen out of the water; the combination of nitrate and oxygen stress can be fatal, especially for larger fish.Many of these problems can avoided by topping off water levels during the summer, and incorporating a pump and filter; these improve water quality, break down waste, and increase oxygen content by creating water movement.Overstocking a pond, especially if it is not well established, places great stress on its occupants, and fish may succumb to usually benign bacteria that are present in the water.Overfeeding is another common environmental problem, especially in temperate areas in the spring and fall; uneaten food decomposes in the water, encouraging populations of pathogens.It turns out that Koi is quite hardy for ornamental fish. 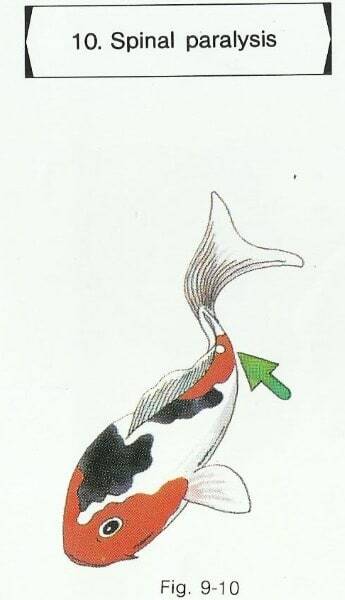 But, on several occasions when there is irregularity in water quality, things may become quite rough for them.Among the most major disease for Koi is Ich parasite or white spot disease.This disease will make the fish look like they have been sprinkled with white salt all over their body.This parasite will attach to the skin, and eat them alive for several weeks before they detach themselves and move to other host.There are several disease affecting them as other fish, but there is one virus, which affected Koi and common carp but not other species.That viral disease called Koi herpesvirus (KHV) or cyprinid herpesvirus 3. Most of the fish infected with this virus will die but some may survive.Those who survive will be the carrier and may send the viral infection to other non-infected fish.In this case, most of the breeders that have Koi diagnosed with KHV in their farm will need to take harsh action to cut all the population to avoid the spreading. 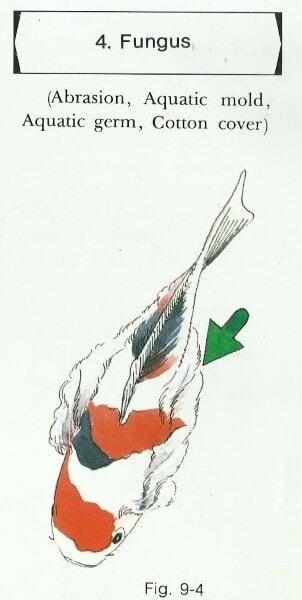 Red swellings appear under the scales.When the tip of a swelling pulled, a worm with an anchor-shaped top comes out.The worms stick to fins, mouths and the hypoderm.Sometimes fifty or sixty worms live on a fish and weaken it to death.Dipterex is efficacious to exterminate them. Small white spots appear all over the body. They increase gradually and the body seems to be covered with the white powder. The extreme case is that the outer layer of the skin comes off and the diseased koi grows weak to death. Its germ is Ichthyophthirus, about 0.7 millimeter long, egg-shaped. Treatment for the disease is a medicated bath of franese for seven days. About one-month-old fry are apt to be affected. by Myxospridea just after they begin to be fed artificial bait. A gill opens wide and shows red swollen gill filaments. 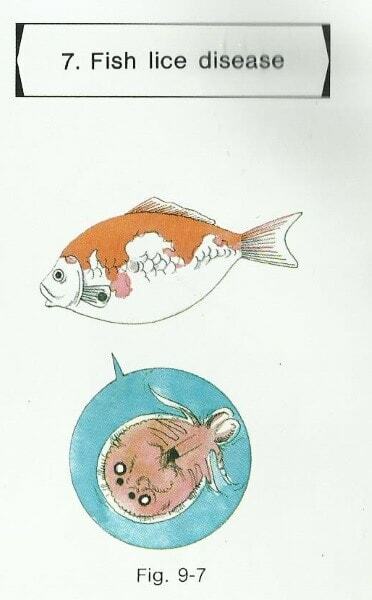 The diseased fish breathes agonizingly and dies. The disease spreads rapidly and many fries die. 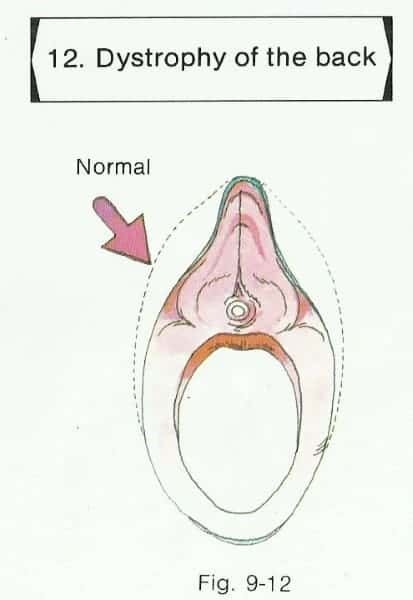 It the disease heals, the jaws of the affected koi will be deformed. 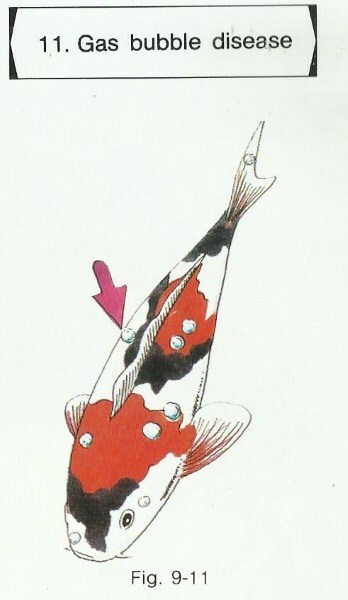 Koi older than two years old are not affected by it because they are immune against it. The cause is Myxospridea. No medicine is efficacious against it. koi aginst Myxopridea is to be given to the koi in the pond. It will be carried on for a week. 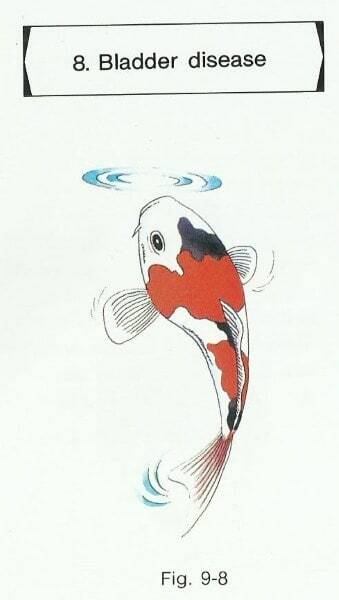 This treatment is effective enve after a koi becomes ill. 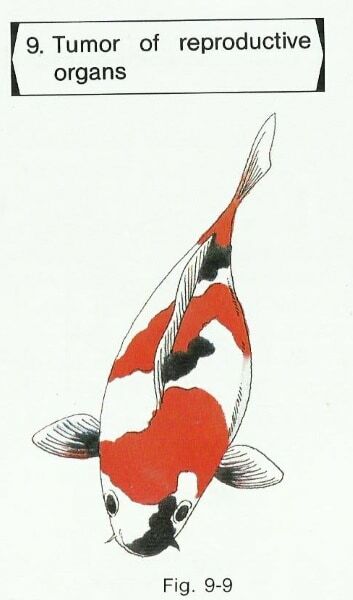 The blood of teh minced koi prevents Mixospridea from growning. How do you treat fungus on fish? The back of a diseased koi caves in along the dorsal fin. The line of the backbone shows itself clearly.Its mortality rate is not high. 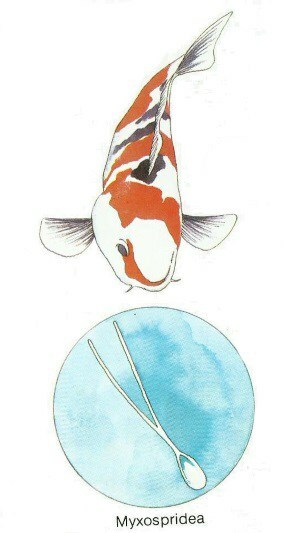 Koi affected by the disease are weak against oxygen shortage or wintering.They are apt to get scraped or molded. The cause is said to be degenerate fat of pupae.A report tells the disease resembles men’s sugar diabetes pathologically.Vitamin E drugs are used for its treatment but it is very difficult to cure it. where to buy metronidazole for fish you can buy metronidazole for koi fish at petstore near you or drug stores. metronidazole for fish dosage Directions from SeaChem Metronidazole; use 100 mg. for every 10 gallons (40 L). Repeat every 2 days until symptoms disappear. If there are no available SeaChem Metronidazole at pet stores near your place. You can purchase Metronidazole for humans. You can buy Metronidazole for humans at any drugs stores near you. Chemipure or similar chemical filter media is also removed during treatment. To feed (use as for a medicated food), use 100 mg. with approximately i tablespoon of frozen or dried food (fried food would need to be placed in just enough water to cover and make wet/moist). Feed until symptoms disappear. Introduction of Metronidazole to the aquarium water when feeding is OK.
Metronidazole can also be used in a fish bath. This is generally performed at double the “in tank” dose as per amount of water used in this bath. I recommend the use of Methylene Blue and maybe salt during this bath treatment too (once or twice per day for 7-10 days). Metronidazole is an antibiotic (for anaerobic bacteria) and anti-protozoal medication used to treat various conditions internally and externally in fish. As for Anaerobic bacteria, these are bacterium that thrive in environments in which there is little oxygen (anaerobic environments) and can cause disease in such environments as the intestinal tract and liver. Metronidazole belongs to a class of antibiotics known as nitroimidazoles which work by ceasing the growth of bacteria and protozoa. Metronidazole works by selectively blocking some of the functions within the bacterial cells and some parasites resulting in their death. Metronidazole is metabolized in the liver (whether a fish or a human). Metronidazoles primary use is for the treatment of ANAEROBIC gram positive & SOME negative bacteria including those that produce beta-lactamase. suspected bacterial pathogens (generally used ina fish food soak for best results). Metronidazole may be a good choice for any bacterial disease present in low oxygen, high bio-load aquariums or ponds. As well Metronidazole is effective for some protozoa. It was originally found effective for the management of infection caused by Trichomonas vaginalis. 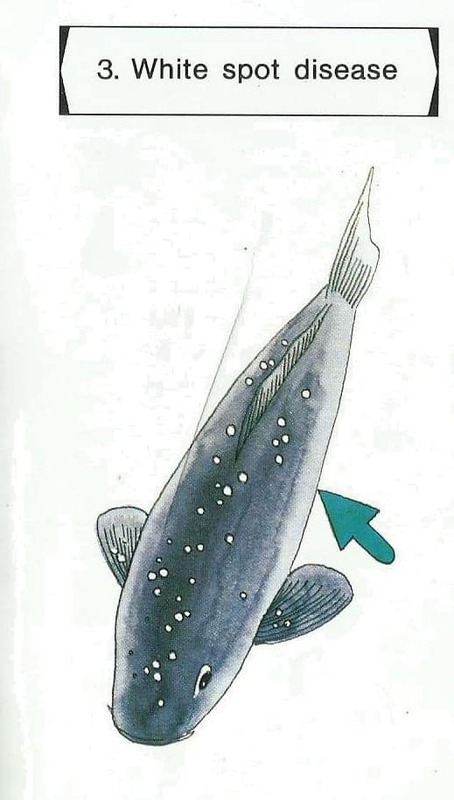 For fish applications Metronidazole has been shown to be in particular more effective for internal and external flagellates. Cryptocaryon in marine aquaria as well as Hexamita & Ichthyophthirius. HOWEVER there is considerable evidence that the cause of “Hole in the Head” is simply the lack of Calcium and even positive calcium ions. This is especially common in aquariums utilizing water softened using sodium chloride or potassium chloride to drive out hard water minerals. Shells mineral blocks should also be used first before treating with Metronidazole (or combined). anaerobic bacteria, Metronidazole along with Neomycin is a good choice for bloating of the digestive tract (common in goldfish). Metronidazole is also effective used in combination (such as with Praziquantel) or by itself for internal parasites such as Nematodes or Trematodes. 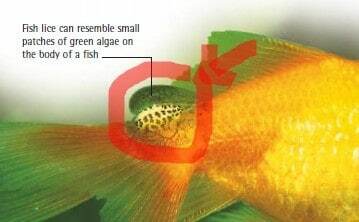 fish are always drinking the water around them, medication is easily transported to the infected area. In Freshwater, treatment can be improved by soaking food as well and this is still an effective freshwater treatment as well. typically suggest 7-10 days, and if you read National Fish Pharmacy instructions for their Metro, they indicate 10 days period, nothing less. Instructions vary and most instructions for treating with Metro indicate repeating dose every 24 hours with a 25% water change before treatment. Part of the reason for the water change is to help reduce the flagellites that are expelled in the feces into the water. A study at the University of Florida on Hexamita in Angelfish and treatment methods showed daily 25% water changes were almost as effective at reducing the amount of Hexamita in the intestines of affected fish as the metro. Metro should be combined with Nitrofuracin Green powder for 14 days to be truly effective. Metro for 10, Nitro in combination with the Metro but for 14 days. What does metronidazole treat in fish? used to treat various conditions internally and externally in fish. What does MetroPlex treat in fish? and anaerobic bacterial diseases of fish (Cryptocaryon, Hexamita, Ichthyophthirius). It does not adversely affect the filter bed and is easily removed with carbon. It can either be dosed into the water or combined with Focus™ in a medicated food mix. What is fish ZOLE used for? is used for parasitic and bacterial infections in fish. Pseudomonas, and Mycobacterial (Gill diseases and Chondrococcus). Metronidazole (National Fish Pharmaceuticals). Hex-A-Mit … Actual dosages are best at about 0.25% Metronidazole fed at a daily rate of 1% of body weight.